Jr. Academy Invites You to Partake in Bring a Buddy Day and Have a Ball! 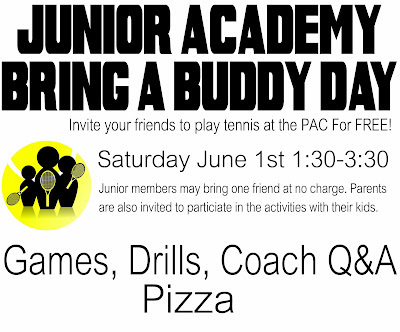 On Saturday, June 1st, from 1:30-3:30pm, Portland Athletic Club invites all Junior Academy members to invite their parents and a friend to take part in two hours of tennis fun for free. Enter a contest to win a club tee-shirt, grab a slice of pizza, and enjoy participating in games, drills, and other activities with your favorite coaches. Parents are encouraged to join in and to interact with their children in an entertaining, stress-free, no pressure arena. Any friend interested in joining the Academy will receive a coupon to take two complimentary lessons with one of our pros! For more information, please call (503) 292-2649 and sign up at the front desk after your next lesson!